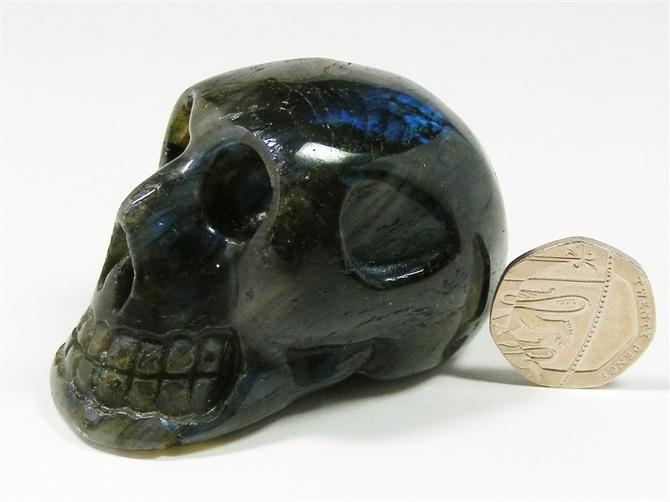 Lovely carving of a skull, cut and polished from a great piece of Labradorite. 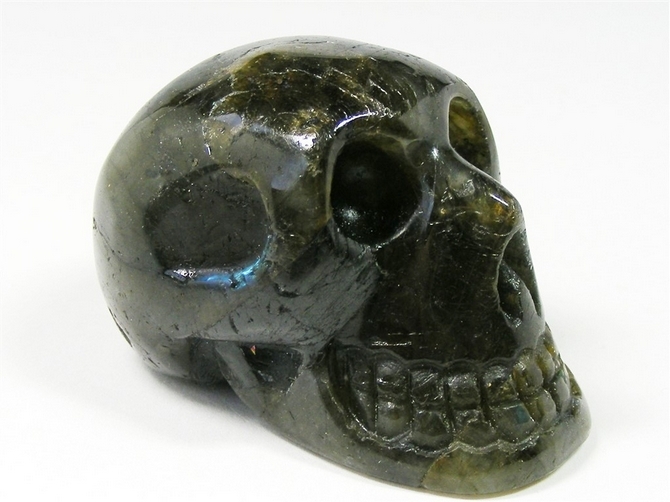 Skulls have become more and more popular over the years and some think that this is because they hark back to ancient times and we need to draw on that energy now. What is interesting is that skulls like to be together. The "feel" or "energy" from a single skull is not just doubled when you place it close to another one, it is increased significantly. People who are into skulls will often have a large collection of them. They are of course ideal for meditation. 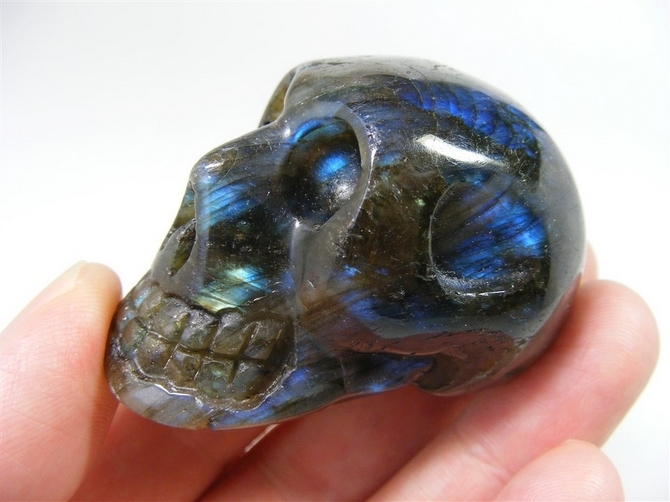 Labradorite is believed to help in treating disorders of the brain and the eyes. It is also said to aid digestion, and is believed to be of benefit in treating colds, gout and rheumatism. 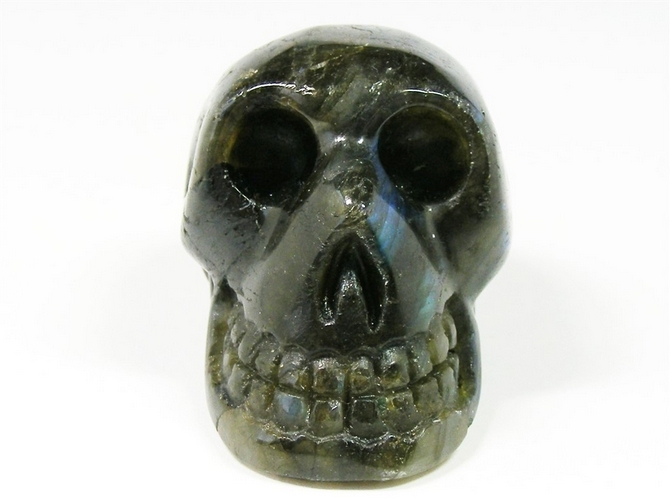 Labradorite helps to reduce fear, anxiety and stress, particularly if this is related to bad dreams or nightmares. Labradorite can also help us through periods of change in our lives by instilling strength and perseverance within us. It also helps us to instinctively know within ourselves, the "right time" for things. 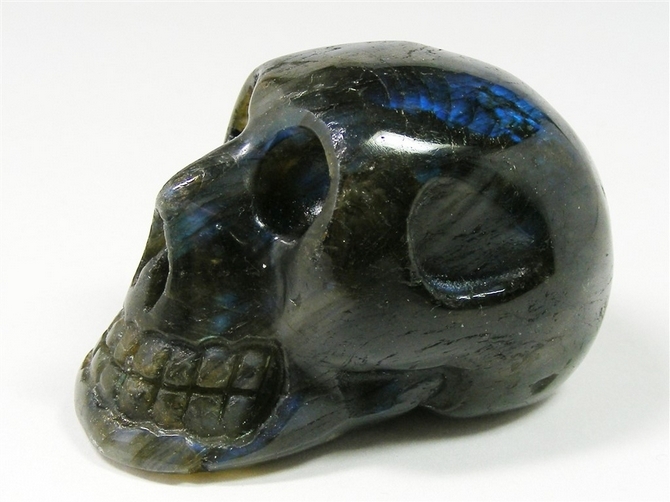 Labradorite can help us to determine our own destiny and to achieve it too. Labradorite is an excellent protector of the Aura, working to deflect any unwanted energies and also keeping it balanced, protected and free from any energy leaks. Labradorite can help us to raise our levels of consciousness and help us to better connect with universal energies. It also inspires us to bring the teachings of other worlds to this, our own world, for the benefit of all humanity. It promotes within us a better understanding of intuition, mysticism and psychic wisdom.